Eddie Long health.Have you seen the recent pictures of controversial man of God ,Eddie Long?The man has in his own words melted away with massive weight loss in what he himself described as a health challenge. 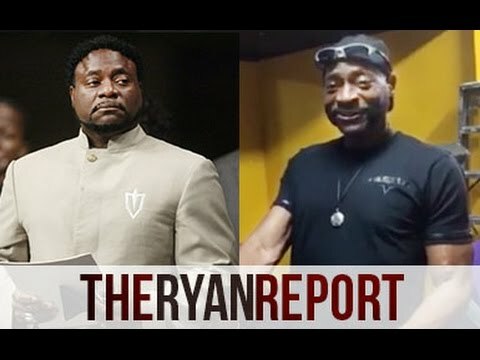 I did not recognise Eddie Long at all when i saw these pictures of him.There have been all sorts of speculations about what could have caused this massive transformation in the appearance and health of the Bishop. statement released by the church that he was recovering from a “health challenge” but did not release any specifics. Speculation has been rampant about the Lithonia pastor’s health since he recently posted a video showing a much-leaner physique. Bishop Eddie Long in hospital. He said he was eating a raw vegan diet and giving up on a “slave menu”. deliver me from” from the challenge. He said he appreciates the prayers and support for him, his loved ones and church family. In the video the megachurch pastor was seen working out and said he had fielded questions from concerned members of his church asking about his dramatic weight loss. Not long ago, Long appeared on the Steve Harvey Show to promote his new book. He showed little of the big weight loss that was evident on the latest video. The video went viral and social media weighing in on his health. “People are asking, ‘Bishop, what happened to all of you?’” he says in the video, posted to his public Facebook page. “Well, all of me has melted away,” he said, drawing out the word melted. He said he wanted to live to be 100 years old and then some. But people have been hearing another side to the man of God's illness.There have been constant searches online of Does Bishop Eddie Long have cancer? Georgia, was hospitalized last week with a grave illness. Founder of Obnoxioustv's blog William McCray III, reported Friday that he was informed by a close friend of the bishop, who he also alleges is a verified member of Long's church, that the pastor is suffering from an unspecified gastro-intestinal cancer that has already progressed to stage 4. "Recently, while out to dinner with some prominent minister friends a person approached our table and specifically want to speak to Sir William, (sic) in a very humble and politely asked if they could have seat. We said sure and the source went on to share they were a member of New Birth and choose to stay through the scandal. The source shared their name and shared they were very close to Bishop Long and asked if Obnoxious Media would take it easy on bishop due to his having cancer," McCray reported. "After a couple of phone calls and text messages it was confirmed this was a very reliable source. They explained that Bishop Long has cancer in his digestive system and it was discovered in the 4th stage and he literally has months to live," the report added. The Christian Post reached out to New Birth Missionary Baptist Church on Monday for comment but a phone message said the church was not open on Mondays. A message left for the minister on call for urgent matters was not returned. According to McCray's source, despite the alleged diagnosis, Bishop Long is banking on his faith for deliverance. The reason for the questions is because there have been strong rumours that Bishop Eddie Long has cancer. The type of cancer he is said to have is gasto intenstinal cancer,which is cancer of the digestive system.